Meet at the Jamaica Bay Refuge Visitor Center for indoor/outdoor program on the many species of ducks and geese that overwinter there. Call the refuge to reserve at (718) 318-4340. Saturday December 5, 9 a.m. to 11 a.m.
Meet Howie Fischer in the parking lot opposite the Mt Loretto CYO building and walk the fields to find winter species that may have arrived. Some of these sparrows, juncos and waterfowl will move on, and some will most likely spend the winter. Hopefully, we will find a variety of ducks in the ponds and in the bay. Geese, loons, gulls and grebes should be there. Binoculars are necessary as well as comfortable walking shoes. Hawks may also surprise us if they are around. Last winter there was an absence of raptors due a low rodent population, so this year may be better. Saturday, December 5, 1 p.m. to 3 p.m.
We will look for evidence of animal life, especially deer, raccoons and other mammals as the winter approaches in the woodlands surrounding Long Pond. We’ll also examine the bird life, geology and evidence of past human use of the area during this unhurried stroll through about one and a half miles of the park. 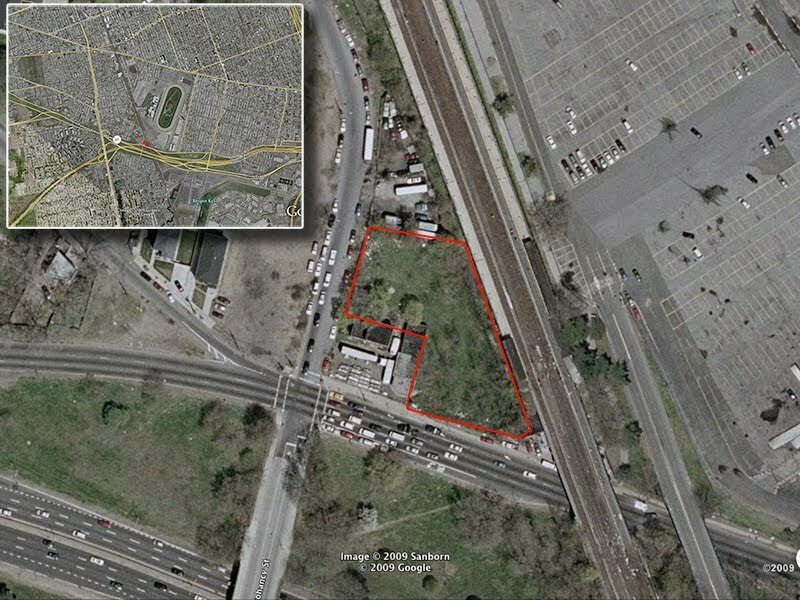 Meet at PS 6, on Page Avenue and Academy Avenue about 3 blocks NW of Hylan Blvd. Sunday, December 6, 5:30 p.m. to 7:30 p.m.
Meet owl specialist Cliff Hagen at the South-east corner of Amboy Rd and Page Ave. For directions or more information call Cliff at 718-313-8591. Read exciting walk description for the Owl Prowl on October 25. 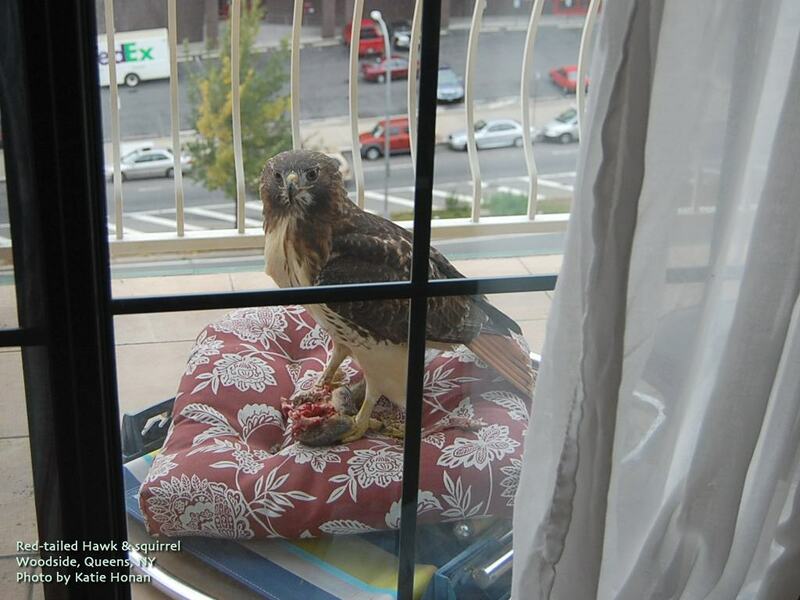 Katie Honan just sent me the following photos of a Red-tailed Hawk she spotted on her balcony. As late-autumn gradually turns to winter, I have some very interesting observations to report, especially over this last week. November is a month when seasoned birdwatchers keep a keen eye out for unusual sightings. Lingering songbirds, such as an Orange-crowned Warbler, is an uncommon treat to find feeding among the increasingly brown wildflowers and shrubs. Sometimes the remnants of a southern hurricane or noreaster will deposit a vagrant from the south or west in New York City, exciting birders from all around the state. At this time of year I regularly scan the Sweetgums in our parks as the tree's spiky fruit morphs from green to red to brown. When the dry, brown fruits open, revealing their cache of tiny seeds, large flocks of goldfinches assemble in the tree's crown. Within those flocks there is always the possibility of finding a rare Pine Siskin or Common Redpoll. October was an unusually mild month. As we approach the end of November, I am struck by all the flowering plants either still in bloom or re-blooming. In Green-Wood Cemetery, the vast plantings of azaleas awoke for a second bloom. I also noticed many rose shrubs sporting new flowers. In the Brooklyn Botanic Garden and elsewhere, irises have opened again. Perhaps I've just never noticed that these plants open in the late-autumn or early-winter. Late last week I rode my bicycle out to Floyd Bennett Field to look for owls ... again. My friend Heydi had been across Flatbush Avenue at Dead Horse Bay, looking for waterfowl and photographing a Common Eider. We decided to meet near the Ecology Village campgrounds at Floyd. [...] As Cattle Egrets have vanished as breeding birds in NYS and New England, November has become a relatively good time for seeing them here. The species has lingered into mid December at least twice on eastern LI, including one at Deep Hollow on the Montauk CBC, on 21 Dec 1996. 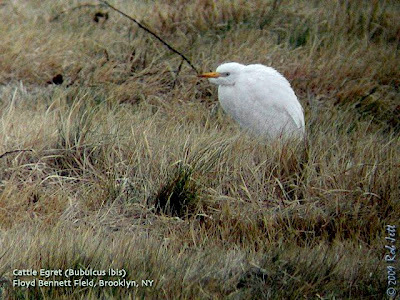 When two Cattle Egrets popped up near Mecox Bay on 17 November 2007, I remember dashing off a note to Hugh McGuinness, volunteering a cockamamie theory of correlated vagrancy of November Grasshopper Sparrows with Cattle Egrets (based on a personal sample size of maybe two!). Although the Grassgroper Hypothesis remains in limbo, chasing down those Cattle Egrets the next day and later certainly revealed how rich and unexpected November birding can be ("Patagonia Picnic in Montauk" Kingbird 58: 2-12). Last year, there was a Cattle Egret at Fresh Kills, Staten Island in November, and one appeared at Mecox again, persisting into December, up to the eve of the Sagaponack CBC." I'm having a difficult time deciding which is more incredible - that a bird of the arid west and southwest flew thousands of miles in the "wrong" direction and dropped down into a tiny, weedy lot nestled between the "A" train station, the highway and an industrial neighborhood or that a biologist, who is very knowledgeable about this unusual species, happened upon it in this most unlikely of places. 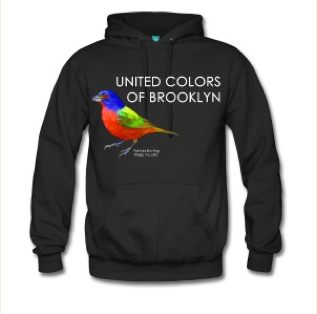 I'm guessing that the average New York City birder would not have been familiar enough with this bird to recognize it as a rarity. Meet 8:30 am at Bartel Pritchard (15th Street/Prospect Park Southwest Ave) park entrance. Meet at the Perkins Visitor Center and learn about bird species found in the area and their interconnectedness with the natural world on these captivating yet peaceful walks. Wave Hill’s garden setting overlooking the Hudson River flyway provides the perfect habitat for native and migrating birds. Ages 8 and up welcome with an adult. Limited to 25. Registration not required. Inclement weather cancels; call 718.549.3200 x245 by 8am the day of the session to confirm. Sunday November 29, 5:30 p.m. to 7:30 p.m.
Meet owl specialist Cliff Hagen at the High Rock parking lot at the top end of Nevada Avenue, off Rockland Avenue. Read exciting walk description for the first Owl Prowl on October 25. For directions or more information call Cliff at 718-313-8591. Greetings. This is the New York Rare Bird Alert for Friday, November 20th, at 7:00 pm. The highlights of today's tape are PINK-FOOTED GOOSE, BARNACLE GOOSE, CACKLING GOOSE, RUFOUS HUMMINGBIRD, BLACK-LEGGED KITTIWAKES, and HARLEQUIN DUCKS. The single PINK-FOOTED, BARNACLE, and CACKLING GEESE continue in the vicinity of Sunken Meadow State Park, north of Smithtown on the north shore of Long Island. On Sunday the geese spent all of the afternoon up until at least 4:45pm feeding with Canadas on the ball fields at Kings Park High School, apparently taking advantage of the lack of activity in the field. Kings Park High School is on the south side Route 25A, 1.5 miles east of the Sunken Meadow Parkway and across from the Kings Park post office. On Thursday the PINK-FOOTED and the CACKLING GOOSE were back at Sunken Meadow State Park, on the lawns east of the entrance road. The Piermont Pier WESTERN GREBE was not seen last Saturday, and it presumably was the same bird appearing off South Amboy, NJ on Sunday. A very dynamic day out at Montauk Point Saturday featured six BLACK-LEGGED KITTIWAKES, plus over 300 COMMON EIDER and 2,000 NORTHERN GANNETS, as well as lots of other sea ducks and loons. Two LESSER BLACK-BACKED GULLS were found on the pasture at the Deep Hollow Dude Ranch on the south side of Route 27, west of the Point, with another LESSER BLACK-BACKED in the surf off the town of Montauk. In the Jones Beach area, two drake HARLEQUIN DUCKS were still present Sunday along the inlet jetty, on the Point Lookout side of Jones inlet. Also feeding along this jetty were DUNLIN and SANDERLINGS, with single WHITE-RUMPED SANDPIPER and PURPLE SANDPIPER. About 100 COMMON EIDER were around this jetty and the sandbars inside the inlet Sunday. And 25 SNOW BUNTINGS were also at West End. 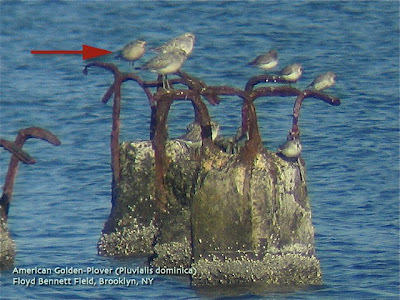 At Jones Beach Field 6 Sunday, the roosting shorebird flock featured ~120 RED KNOT. At the east end of the Jones strip Sunday, a YELLOW WARBLER was found at Captree State Park, and a RED-NECKED GREBE was seen in Great South Bay off Captree. Interestingly, another YELLOW WARBLER plus an ORANGE-CROWNED WARBLER were at Marshlands Conservancy in Rye on Monday. On Thursday a CATTLE EGRET was spotted around Field B at Floyd Bennett Field, this continuing what has become somewhat of a trend in recent years of these late season appearances of Cattle Egret. The egret was seen again today. Last Sunday in Brooklyn, 27 COMMON EIDER were seen off Brighton Beach, and four late BLACK SKIMMERS were lingering off the western end of the Coney Island boardwalk. A COMMON RAVEN was seen again Monday around the Nassau County Art Museum in Roslyn, and a COMMON MOORHEN found on the pond at the end of Garvies Point Road in Glen Cove back in late September was still present there last Saturday. An immature BALD EAGLE visited Long Pond in Sag Harbor on Tuesday. Saturday, November 21, 9 a.m. to 11 a.m.
Meet Howie Fischer in the first large parking lot, in from the Hylan Boulevard entrance opposite Buffalo Street. We will then go to the flats facing the bay, to find and “scope” for migrant waterfowl that are arriving at this time of year. If it is low tide, we may find some lingering shorebirds as well. We hope to find loons, grebes and a variety of sea and bay ducks. Perhaps some passerine birds such as towhees, sparrows and finches will still be lingering near the nature center feeders and pond. Binoculars are needed. Saturday, November 21, 10 a.m. to 1 p.m.
Meet at the side of Meisner Ave. (toward the Eger Home) close to the intersection of Meisner and Rockland Avenues. We will follow the White Trail south toward Eleanor Street and uproot or prune invasive vines that strangle the trees and shade out our native plants. We will try to uproot some of the spreading multiflora rose. If you don’t have your own, Protectors will supply gloves and pruners (and refreshments). After a two hour work session, we will take a short walk over nearby trails. Call Don Recklies at (718) 768-9036 or Chuck Perry at 718-667-1393 for more information. Saturday, November 21, 1 p.m. to 3 p.m.
Join naturalist Sandra Mechanic on a stroll through the Latourette Woods. Admire the famous Frank Lloyd Wright house along the way and see a pair of very tall 100+ year old American Larch or Tamarack trees, conifers with needles and cones but not evergreen since they annually shed their needles. The trail passes through a large forest of mixed age Tuliptrees and numerous other tree species we can easily identify as it winds down to Meisner Pond. 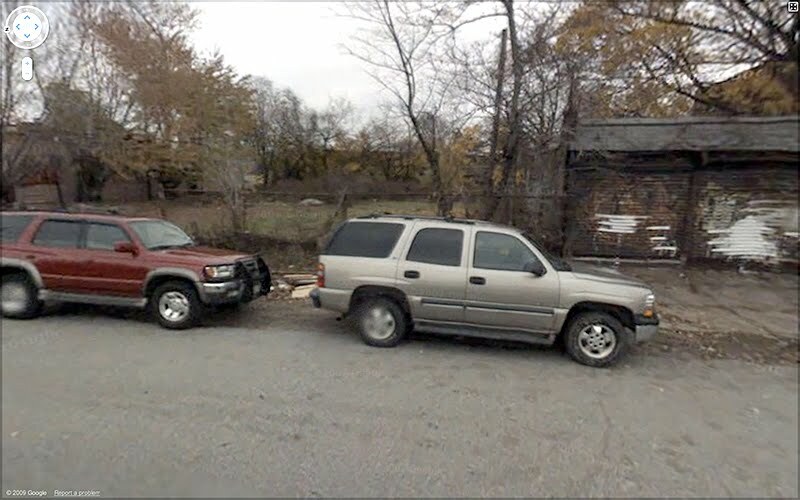 Park and meet near the end of Old Mill Road, near St Andrews Church, off Arthur Kill Road. For more information, phone Sandra Mechanic at 718-967-1037. Join Cathy Zelonis in a walk around the wetland (the Loosestrife Swamp) to look and listen for bird songs. We shall identify the plants we see, including Skunk Cabbage, Spicebush and the beautiful Tupelo tree. We’ll walk uphill and identify forest trees and shrubs and find their fruits, which feed wildlife in winter. Bring water and dress for the weather. Meet in the parking lot at the top of Nevada Ave.
For more information call Cathy at 917-596-4198. Sunday, November 22, 1 p.m. to 3 p.m. 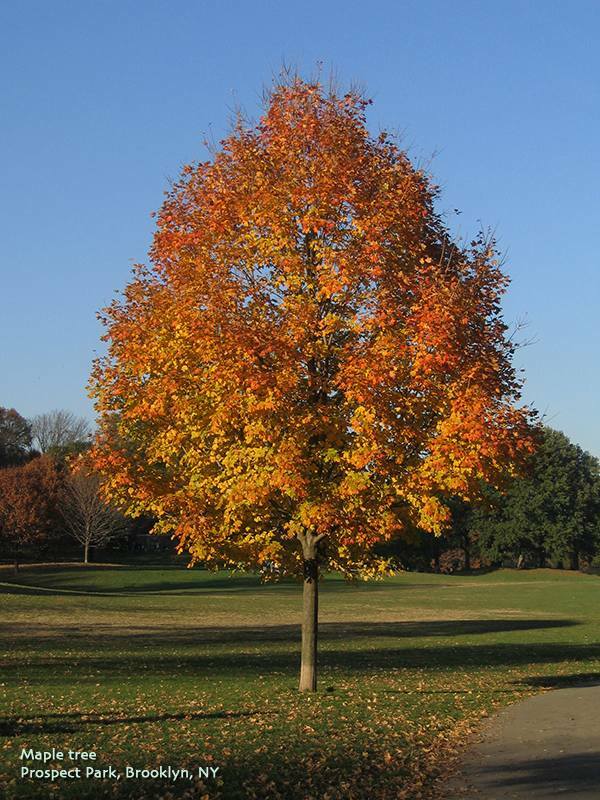 Learn which trees are native and the few that are not. Naturalist & photographer Sandra Mechanic will show how to recognize them by the MAD Horse acronym as a mnemonic to aid identification. We will identify trees by bark, bud and leaves on the ground. Sandra will explain the names as we pass the famous Spring Peeper and Wood Duck Ponds on our way to see Heyerdahl Hill and the N.Y. State rare Persimmon Trees. Meet at the intersection of Manor Road and Rockland Avenue, near the wide entry road to Eger Home up the hill. Bring binoculars and tree guides. Wear study shoes. For more information, phone Sandra Mechanic 718-967-1037. Sunday, November 22, 6 p.m. to 8 p.m.
Meet owl specialist Cliff Hagen at the South-east corner of Amboy Rd and Page Ave.
For directions or more information call Cliff at 718-313-8591. Read exciting walk description for the first Owl Prowl on October 25. Meet at Orchard Beach parking lot. Join us for bird watching! Come and learn the basics of mycology as we search for mushrooms around the park. Join us on our annual turkey count as we try to find this elusive bird on the Siwanoy Trail. Cornell Lab of Ornithology has a really great citizen science project call "Celebrate Urban Birds". 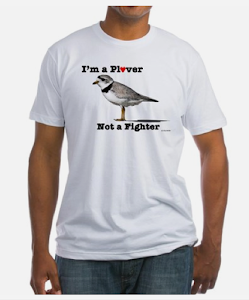 The website has a lot of good information and resources for the beginner to intermediate birder. It also provides fun material for educators and groups organizing events. 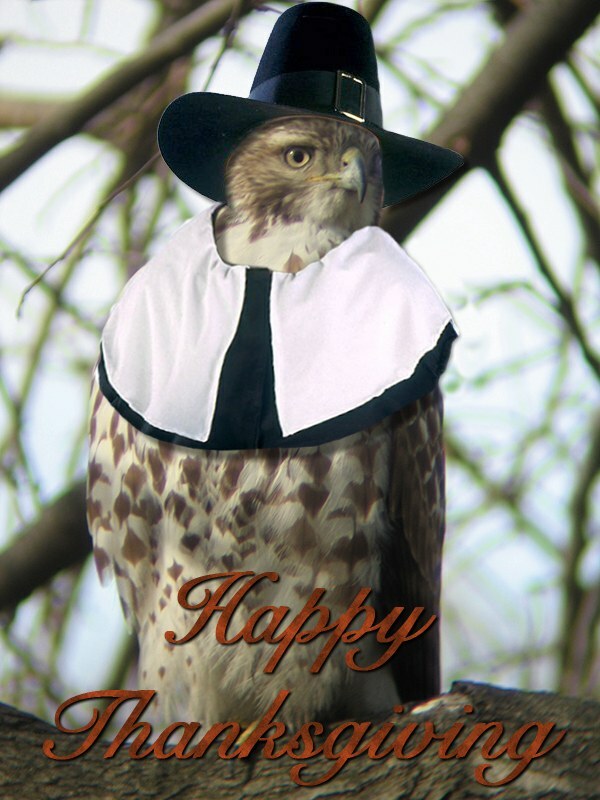 I received a call from Bobby this afternoon regarding the St. Agnes Church Red-tailed Hawk. The feisty male hawk was ready to be released and Animal Care & Control was coming by his place to pick it up. I've been thinking about owls a lot lately. November is usually the month when migratory species begin to move through our area, which has motivated me to start checking stands of conifers for any signs. 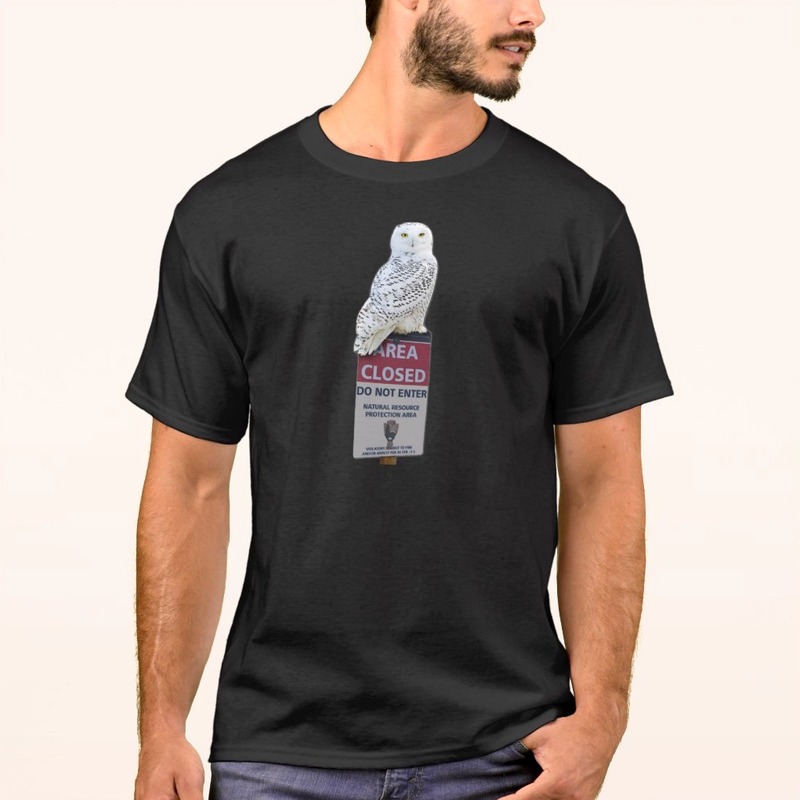 The most common species of owls (but which are rarely seen in abundance) that spend the winter in New York City are Long-eared Owl and Northern Saw-whet Owl. Both are highly sought after by birdwatchers and are usually confined to only a few regular locations around the five boroughs. Saw-whet Owls are adorable, little birds only about the size of my fist and are easily overlooked. The first one that I ever saw was in 1994. I was walking in Prospect Park with my friend Jerry Layton when he suddenly stopped and said, "I can't believe I'm looking at an owl!" He pointed off in the distance (at least what I thought was the "distance"), but I couldn't find it. After several minutes trying to describe the location, Jerry finally walked about two yards away, pointed his finger at a shrub to a point about four feet off the ground and said, "Right there!". It was so close and unexpectedly compact that I was looking right passed it. When the owls in Green-Wood were incubating eggs, one of the guys in the landscape crew would stop his truck on the road adjacent to the nest tree and honk his horn to try and make the bird move. I don't think this man intended on harming the birds, but just did it out of ignorance. Last year's nest tree succumb to a fungi and had to be cut down. I'm hoping that the owls find a new tree that is more isolated. Perhaps I should also give a brief lecture to the landscape crew about proper owl etiquette and the importance of respecting their roosting spots. Earlier in the week I rode my bicycle to Dreier-Offerman Park, then continued north along the promenade at Gravesend Bay towards Owls Head Park. Along the route I didn't observe much bird activity, but did find a new arrival on the rocky shoreline below the Verrazano Bridge. It has only been in the last couple of years that I became aware of the birding potential along the narrow strip of habitat at Gravesend Bay. Later on in the winter, large rafts of waterfowl (mostly scaup) are attracted to the relative calm coastal waters and Purple Sandpipers gather and overwinter at the edge of the turbulent rocky shoreline. 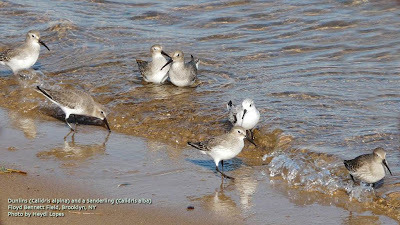 Finding these sandpipers so close to lower Manhattan is unusual and I used to travel out to Breezy Point to find them. Overwintering birds depart for their arctic breeding ground by late-May. I was curious when they returned to NYC. I ran into Heydi at Dreier-Offerman Park and, after finding little bird activity there, we decided to check out Gravesend Bay. 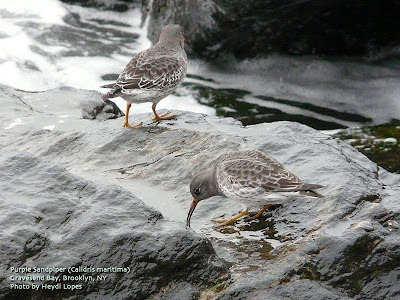 I hadn't read any recent reports of Purple Sandpipers from other birders and was wondering about their arrival dates. Some populations of Purple Sandpipers breed along the eastern edge of Hudson Bay. 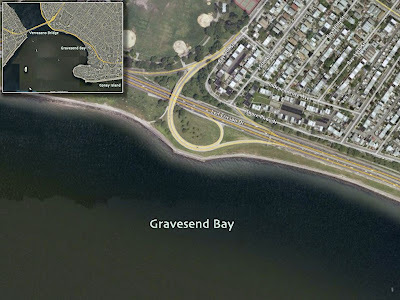 Is it possible that the flocks that winter along Gravesend Bay are from that location? It would be a straight shot from Hudson Bay to the headwaters of the Hudson River, where they could continue following the liquid highway until it spilled out into Raritan and Gravesend Bays. These birds get their common name from the subtle, iridescent purple sheen of their feathers seen in bright sunlight. On this overcast, dark morning they would appear as a nondescript, grayish shorebird with orange bills, legs and feet. They are easily overlooked as they move slowly among the huge, seaweed encrusted boulders that line the shore. Scaup flocks haven't arrived at this edge of Brooklyn coastline, yet, and other than several Red-breasted Merganser and a few Common Loons, the wasn't much to see. Following the promenade north, towards the bridge, we constantly scanned the rocks below us looking for any movement. Finally, at about 1.25 miles from the path's starting point at "Toys-R-Us", I spotted the silhouette of a shorebird at the peak of a large boulder. As we focused our bins we noticed 4 more birds close by. The Purple Sandpipers have returned for their 6 month respite. To get to the promenade by public transportation take the "R" train to the "Bay Ridge, 95th Street" station. Walk south along 4th Avenue to the pedestrian highway overpass. At the promenade, I recommend walking south, towards Bensonhurst. 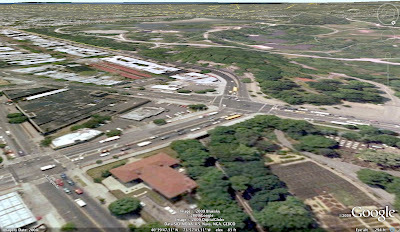 Alternately, you can take the "D" or "M" train to the "Bay Parkway" station, walk south on Bay Parkway to the promenade, then walk north along the promenade. 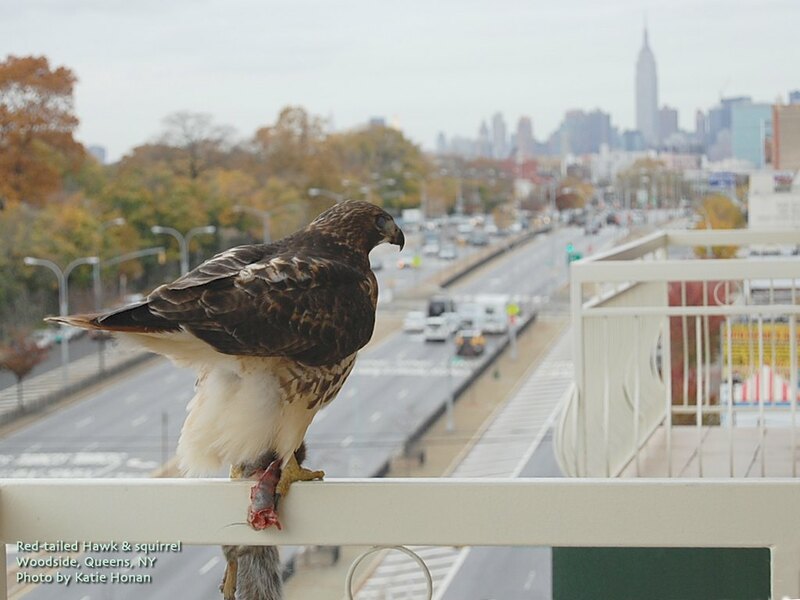 Letting you know that Animal Control just dropped off here an adult, light-eyed, male Red-tailed Hawk that had been trapped in the attic of St. Agnes Church at 499 Sackett St., Brooklyn. It had been stuck inside there for 5 days. The maintenance people there opened a window but it didn't open enough for the bird to get back out and it flew into it hard enough to break it. It got in through a roof vent. Inside the attic there are many pigeons, dead and alive, and it actually came in here with a full crop. [...] it was still able to fly somewhat in this huge standup attic before being caught by CACC personnel. The conditions in the attic were terrible and it made for a dangerous situation for humans. They did an excellent job netting him. It looks disheveled from the ordeal but, baring any injuries, it can be released nearby probably early next week. We'll band him and give him back to CACC who can release either there or at Prospect Park which they say is nearby. No way of telling if this is a resident bird or someone passing thru but to be safe I'd rather put it back in the neighborhood it came from. I doubt he'll return to the same place after his short stay. At least not flying into the building (hopefully). The saw-whet that came in from Manhattan a few weeks ago is doing great and will be released in a few days. 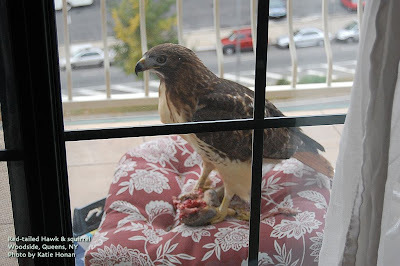 The red-tail with the cut talons is outside now, eating on her own and remaining pretty calm so hopefully the wing heals well. During this point in the fall migration waterfowl have begun streaming along New York City's coastline, as well as, descending into our inland ponds and lakes. Many will overwinter here and some will continue moving south. In addition to the various ducks, several species of loons and grebes have started to appear. This seasonal abundance isn't just a boon to birders searching for something different, but also a local predator of incredible speed. Prospect Lake, in my local park, has been slowly filling up with flocks of Northern Shovelers and Ruddy Ducks. To a lesser extent, American Coots have been making their annual appearance. On a recent visit to the park I counted ten species of waterfowl, plus Pied-billed Grebe and American Coot. This concentration of birds on the 10-acre lake had also attracted a Peregrine Falcon. Perched at the top of a dead tree on West Island, the world's fastest animal seemed content to just relax and ignored the ducks below him. His distended crop told me that he had recently eaten. 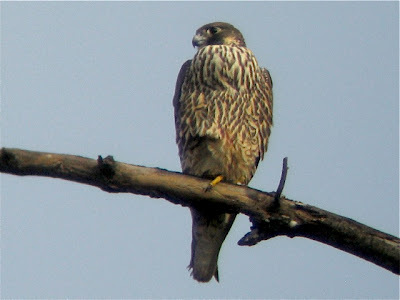 The archaic common name for Peregrine Falcon was "Duck Hawk". The day after I photographed this juvenile falcon at the edge of Prospect Lake I walked over to the Brooklyn Botanic Garden. At the south end of the garden is a very large antenna tower. It is a favorite perch for birds of prey, so I shouldn't have been surprised to find two adult Peregrines relaxing near the top of the tower. 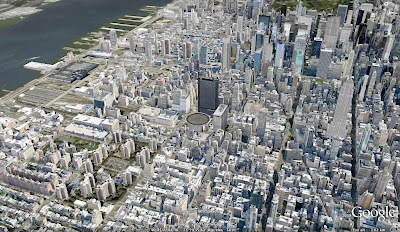 Using Google Earth, I created a perspective 3D satellite image to approximate the view from the top of the antenna. From their perch near the top, the falcons had a perfect view of Prospect Park's waterways ... and hundreds of waterfowl, fattening up for a long winter. Part of the birding experience is sharing, or passing along knowledge to other birders, that includes helping someone find a "life bird". I had that opportunity, recently, and it nearly mirrored an experience I had during the late fall of 2003. During a bike ride out to Floyd Bennett Field I ran into my friend Heydi. We both had a general idea of what birds might be around the varied habitats of the nearly 400-acre site. Migrating sparrows had mostly left the community garden and other grassy habitats. Horned Larks hadn't arrived from their arctic breeding grounds and overwintering owls had yet to be reported around the NYC area. Heydi and I scoured the grassy edges of Floyd Bennett then headed over to the pines at "Ecology Village". The existing, mature conifers have all been dying off and the National Park Service has slowly started replanting native pines. The remaining trees don't offer much cover for any Long-eared Owls or Saw-whet Owls. We left after only a brief survey for white-wash or pellets and headed towards Archery Road. Along the Jamaica Bay side of Floyd Bennett Field are the remnants of an old pier. Closer to shore is a stretch of creosote coated wooden pilings. Farther out are hunks of concrete with exposed, rusted rebar. These little islands offer convenient perches for cormorants, gulls and shorebirds. It was in this area that I saw my first American Golden-Plover. The date was October 18th, 2003. I was with my friend, Shane, a more experienced birder. We had spent the morning birding the grassy areas at Riis Park and Fort Tilden then made a quick stop at Floyd Bennett Field. It was 60 degrees with clear, sunny skies. At the end of the Archery Road we found a hundred or more Black-bellied Plovers jostling for a prime perch along the wooden and concrete pilings. Smaller Dunlins were trying to squeeze in on lower ledges or were foraging along the beach. We took our time scanning all the birds for something different. After a few minutes Shane exclaimed, "I've got a golden-plover". 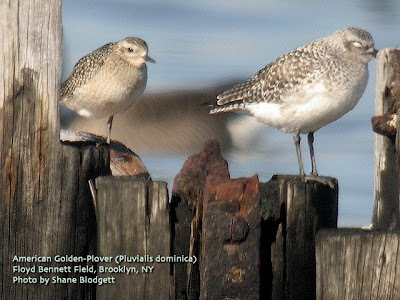 As I studied the bird through Shane's scope, I remember thinking that it wasn't nearly as difficult to tell apart from the Black-bellied Plovers than the field guides made it seem. What made this experience even more memorable was that Shane took a photograph of my life American Golden-Plover. Saturday, November 14, 12 noon to 2 p.m.
Life in the Intertidal Zone—Past and present blend in the Conference House Park where history stretches back thousands of years with the seasonal occupation of the Lenape and hundreds of years with the habitation of the Dutch and English. In addition to the local history we’ll observe the geology of the area and look for what the debris at the high tide line has to reveal. As the tide goes out we’ll move into the intertidal zone to find out what sorts of living things survive in this challenging environment. It’s going to be muddy so dress appropriately. 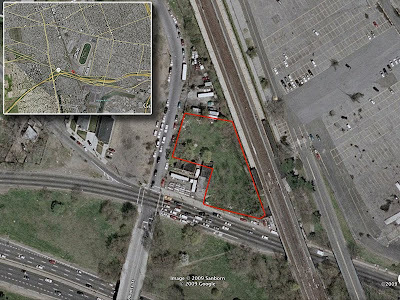 Meet at the parking lot at the end of Hylan Blvd. on the left. Saturday, November 14, 1 p.m. to 4 p.m.
Pine Barren Trees and Wildlife—Find out why Protectors urged the preservation of this parkland and how we got our name in 1975. It has rare Southern pine and oak trees, nothing like our Greenbelt forest. With a park permit, Sandra will lead us into the restricted area where few have trod. We will check in the sand, snow or mud for deer prints throughout the park. We’ll find the diseased clones of the American Chestnut that has produced flowers and fruit the past few years and the healthy 7 to 8 inch diameter chestnut tree, now 20+ feet tall and 9 to 10 inches in diameter and still disease free. The normal trunk-splitting at the base is not indicative of chestnut blight unless a fungus growth is observed. Meet at the old park office building at the end of Carlin Avenue, off Sharrotts Road in Rossville. Wear waterproof shoes. Call Sandra Mechanic at 718-967-1037, for more information. Saturday, November 14, 10 a.m. to 11 a.m.
A Geology tour of Graniteville Quarry with renowned SI geologist, Dr. Alan Benimoff—Learn from Dr. Benimoff about Staten Island’s geologic history and why this site where trap rock was mined many years ago is world famous among geologists and students of geology. It has a very special rare rock called Trondhjemite, some 200 million years old, that lies in the midst of a huge deposit of Palisades Diabase, the same kind of rock that makes up the New Jersey Palisades. It is attached underground to the N.J. Palisades as well as to the rock quarry just before the Bayonne Bridge in Elm Park. At the Graniteville Quarry, the top surface of the underlying Palisades Diabase rock also shows visual evidence of glacial polishing and scouring from the continental glacier that melted on S.I. 22,000 years ago. Protectors, along with the late Assemblywoman Elizabeth Connelly, was instrumental in having this geologic treasure preserved as a small community park. We meet by the park on Forest Ave. near Van Name Ave. Find parking on Van Name Ave. or Simonson Ave.
For more information, call Alan at 718-477-1974. Sunday, November 15, 12 p.m. to 2:30 p.m.
Join Hillel Lofaso on a walk of the highlights of the Blue Trail in the autumn woods of the Greenbelt. We meet at the entrance to High Rock Park at the top of Nevada Avenue. Explore swamps, ponds, glacier sculpted terrain and a million dollar view from the overlook. Bring lunch to eat while we enjoy the view and share our impressions about Staten Island’s natural areas and environment. Beverage, snacks and sturdy shoes recommended. This is a moderately long, level walk, suitable for youngsters. Call Hillel at (718) 751-6629 for more details. Sunday, November 15, 1 p.m. to 3 p.m. Explore the woodlands with Clay, above the beach at the bottom of Page Avenue off Hylan Blvd. Besides the wildlife we’ll be looking for old foundations and evidence of human occupation in the past few centuries. Dress sturdily, with water-proof footwear and warm clothes. Owls, Raptors, Sparrows and a mix of other fall migrants are found on this fall favorite. "Hue" should definitely experience the color palette of this beautiful wooded park. 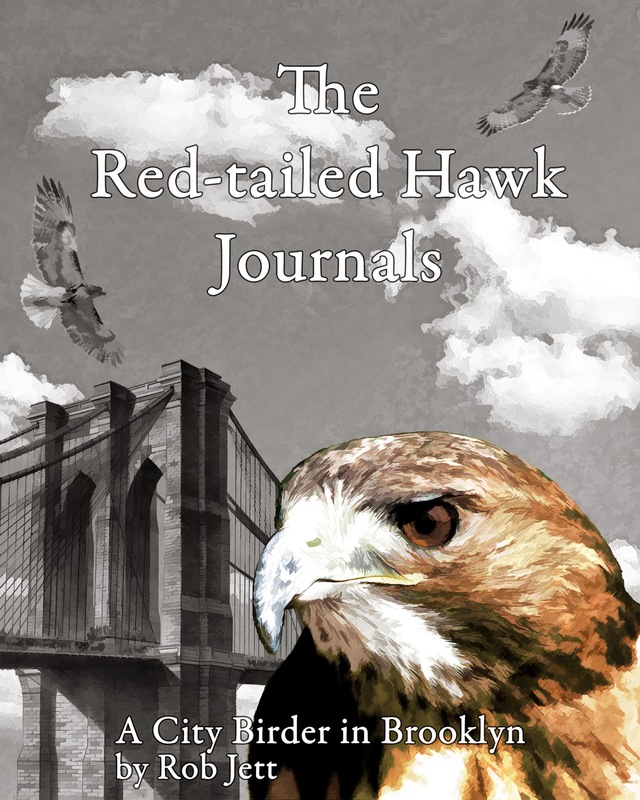 I just read an interesting posting on the New York State Birding list regarding a Red-tailed Hawk in Midtown Manhattan. 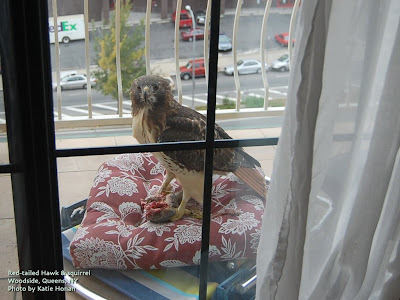 "Tracy Meade and Stuart Cocheran just witnessed an adult Red-tailed Hawk crash into a building at 31st St and 7th Ave in Manhattan and fall about 10 stories to the sidewalk below. In an attempt to protect the bird on the busy midtown sidewalk, and pending the contact of more professional help, Tracy approached close to the bird with her overcoat. Apparently only stunned, the Hawk opened one eye and escaped under a parked car. After a few moments the hawk, revived , came out, spread it's wings and was able to fly off over 31st Street toward Madison Square Garden and the Hudson River, fightening pedestrians and pigeons alike as it rose up." "It is hard to understand why it crashed, the building is mostly stone with smaller windows, not a glass face building reflecting the sky. Perhaps it was doing a Peregrine impression, trying to take a pigeon out of the air and missed it's mark." Saturday, November 7, 2009, 1 p.m. to 3 p.m.
Park at the end of Old Mill Road, alongside St. Andrew’s Church in Richmondtown, off Arthur Kill Road. We’ll stroll along a newly designed multi-use trail, looking out to Fresh Kills, below the hills of Latourette Golf Course, and return along the forested Blue Trail. This area has not been accessible for many years and is now open to the public. We are surrounded by beautiful, old woodlands as well as newly grown stands of cottonwoods and other pioneer plants. We’ll see the flow of the famous Hessian Spring as it crosses the old road and view Fresh Kills estuary. We'll be looking for birds in Marine Park. Come enjoy this hike and learn about Anne Hutchinson and indigenous people of the area.